December 3 is the International Day of Persons with Disabilities. Every year, on this day, the international community comes together to take stock of the progress that has been made to advance the rights of people with disabilities around the world. At the World Bank, we commemorate the signing of the United Nations Convention of the Rights of Persons with Disabilities and underscore our commitment to Sustainable Development Goal 4 (SDG4), to “ensure equal access to all levels of education and vocational training for the vulnerable, including persons with disabilities” by 2030. Yet, despite these international commitments, globally, too many students with disabilities still face significant barriers when it comes to attending school. There has been a noticeable lack of entries to the East Asia & Pacific finance blog recently, but unfortunately I've been otherwise occupied on a trip in Beijing. It has certainly been a busy time here in China's capital with the National People's Congress (NPC) going on. However, I haven't seen much of it other than the long traffic jams caused by the road closures. The NPC meetings covered some of the domestic economic stimulus plans, but it has not dealt directly with financial sector issues. Maybe it did not need to since the banks here have already responded to the stimulus. 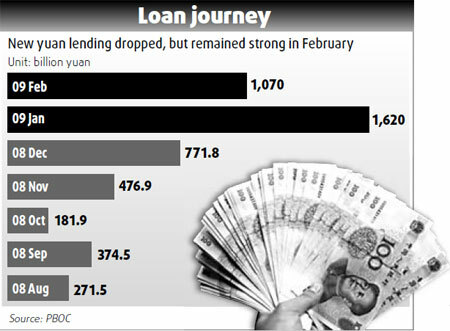 A recent China Daily report had a great graphic that showed the recent boom in lending by the banking sector, which corresponds very nicely to the announcement of the original economic stimulus plan. As I highlighted in a prior blog post, the $586 billion economic stimulus plan announced in November was only 30 percent funded from the central government, and the expectation was that much of the rest was to come from state-owned banks. Well, it seems they have delivered with gusto! We cannot be too optimistic on China’s exports, even though we think the country’s competitiveness is still strong. Image credit: scobleizer at Flickr under a Creative Commons license. As we were looking at recent developments as background for our China Quarterly Update, which was released yesterday, we had to make up our minds about how well China’s exports are doing. This was necessary because there are conflicting answers to this question. On the one hand, we are reading many reports from the coastal provinces, Guangdong in particular, about how bad things are there in the export industries, with factories closing and migrant workers going back to rural areas. On the other hand, the data on overall export developments suggests exports have held up reasonably well so far, with overall exports in real terms still far outgrowing overall world import growth, implying continued gains in global market share for China (see left hand figure below). An important part of the answer lies in the fact that the export performance differs markedly between sectors. Exports of light manufacturing products, such as textiles and toys, are by now lower than a year ago in real terms (see right hand figure below), while real exports of (higher value added) machinery and equipment are still growing by over 30 percent year-on-year. Exports of light manufactures have been hit by cost increases as well as weak overall foreign demand—which matters a lot because China now produces the bulk of global production in certain sectors, such as toys. On the other hand, China’s exports of machinery and equipment still occupy modest market shares globally, and China’s strong underlying competitiveness means that its exporters can continue to gain market share even in more challenging global circumstances.